Subrahmanyan Chandrasekhar was an astrophysicist. He discovered that massive stars can collapse under their own gravity to reach enormous or even infinite densities. Today we call these collapsed stars neutron stars and black holes. He was the third of ten children in a well-educated family: his mother was a translator, who taught her children to read, while his father was Deputy Auditor General of the Northwestern Railways. The Nobel Prize winning physicist C. V. Raman was his father’s brother. As a young boy, he was home-schooled by his parents and private tutors. In 1929, aged 18, he wrote his first academic paper, The Compton Scattering and the New Statistics. The following year, he graduated with a B.Sc. Honors degree in physics. Chandrasekhar had already been identified as having extraordinary potential in physics; as a result of this he was awarded a scholarship to study for a Ph.D. degree at the University of Cambridge in the United Kingdom. His supervisor at Cambridge was the physicist and astronomer Ralph Fowler. While traveling by ship from India to Britain in 1930, Chandrasekhar reviewed Fowler’s and others’ work on the degenerate electron gas in white dwarf stars. He updated the classical physics used previously to understand the behavior of the electrons, incorporating the new relativistic physics of Albert Einstein. Although he was just 19 when he did it this work, it led to his Nobel Prize in physics. In 1931, Chandrasekhar visited Göttingen, Germany, where he had been invited to spend summer working with the future Nobel Prize winning physicist Max Born. In 1932, Chandrasekhar moved again, this time to Copenhagen, Denmark where he worked at the Institute for Theoretical Physics, founded 12 years earlier by Nobel Prize winning physicist Niels Bohr. In 1933, he returned to Cambridge, where at the age of 22 he received his Ph.D. degree. He was also awarded a Fellowship to continue research at Cambridge for four more years. Between the ages of 18 and 28 (1929 to 1939) Chandrasekhar was intensely interested in the physics of stars – astrophysics. Traveling by ship in 1930 to begin his Ph.D. at Cambridge, he calculated a number. In his honor this number is now called The Chandrasekhar Limit. Its value is 1.4. This number determines the fate of stars. Chandrasekhar published his result in 1931 in the Astrophysical Journal. In several billion years, our sun will become a white dwarf. In 1930, astrophysicists believed all stars would eventually fade to become white dwarfs. Chandrasekhar discovered that a white dwarf can exist only if its mass is less than or equal to 1.4 times our sun’s mass. Chandrasekhar initially found the limit would be about 1.7 solar masses, but over time, he refined this value. At the end of a star’s life, if its remaining mass is greater than 1.4 times our sun’s mass, then its ultimate fate will be rather strange. 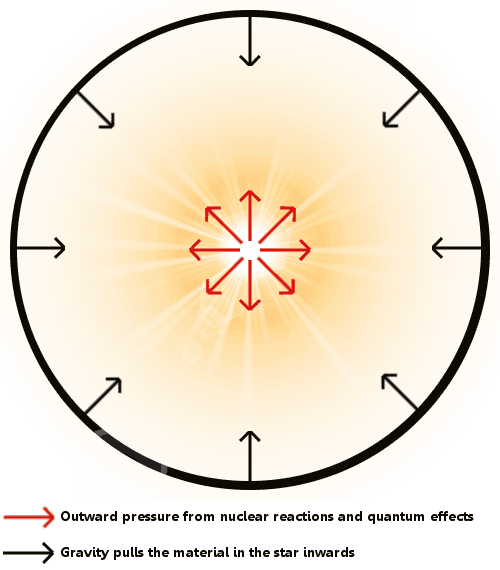 The outward pressure of nuclear reactions and inward pull of gravity in a star are usually balanced. When the star nears the end of its normal existence, after burning much of its fuel, the outward push weakens, and the star begins to shrink. How much it shrinks depends on its mass, because the more mass there is, the stronger the inward force of gravity will be. If the mass pulled inward is less than or equal to the Chandrasekhar Limit, the star will become a white dwarf, with a density typically of about 1 metric ton per cubic centimeter. become a black hole, with a central singularity of infinite density. 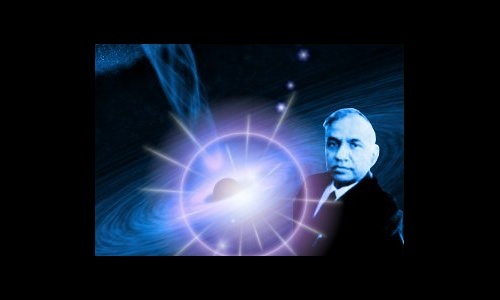 Chandrasekhar did not propose the existence of neutron stars or black holes, but in 1932 he wrote that for all collapsing stars of mass higher than the (Chandrasekhar) limit, there were no known forces that could prevent a singularity forming. For physicists, a singularity is a point with zero volume into which a star’s entire mass has been crushed by gravity. Today we know all black holes have a singularity at their centers. Unfortunately, Chandrasekhar’s view was opposed by the foremost authority on the physics of stars at the time, Sir Arthur Eddington, who was also at the University of Cambridge. Eddington did not believe matter could be crushed to the incredible densities Chandrasekhar’s theory predicted. After all, he was being asked to believe the entire mass of the moon could be crushed into the volume of large building, or nothing! No, said Eddington, such densities were impossible. His emphatic view was that there must be some higher, undiscovered scientific principle which simply stopped incredibly dense objects being formed. Our modern understanding is that Chandrasekhar was right, and Eddington was wrong. Unfortunately, although he won private support from eminent physicists such as Wolfgang Pauli, Niels Bohr, and Paul Dirac – who agreed with his calculations – they would not publicly support Chandrasekhar’s conclusions. In 1937, his four year fellowship came to an end. Chandrasekhar was frustrated at the lack of acceptance at Cambridge for his theory about the fate of high mass stars. He took a position as research associate at the University of Chicago in the USA, and remained affiliated with that university for the rest of his life, becoming an eminent professor. He continued his work on the limits of white dwarf formation for two years, then drew a line under it and moved on. This would become the pattern of his research work for the rest of his career. He would master a field, publish groundbreaking research in it, then move on. In 1952, he became managing editor of the Astrophysics Journal, remaining in this highly demanding role until 1971, building it from a rather small publication into the foremost international journal of astrophysics. This period was one of enormous commitments for Chandrasekhar, because he continued his research work, his writing, and his university teaching, maintaining his usual very high standards in all of these roles, while managing and building the journal. In the end, scientists came to accept that Chandrasekhar was correct, and Eddington was wrong. It was a slow process, taking about 30 years. It is now accepted that the ultimate fate of stars depends on their masses. Smaller stars become white dwarfs, while larger stars, after a supernova, can become neutron stars or black holes. In 1983, Chandrasekhar was awarded the Nobel Prize in physics “for his theoretical studies of the physical processes of importance to the structure and evolution of the stars.” He shared the prize with William Fowler. Subrahmanyan Chandrasekhar died of a heart attack on August 21, 1995, aged 84. He had retired from his role as a full professor at the University of Chicago in 1980. He continued living in Chicago and his output of scientific books continued. His final book was Newton’s Principia for the Common Reader, a masterpiece published shortly before his death. He was survived by his wife Lalitha, who died in 2013 at the age of 102. Today, NASA’s Chandra X-ray observatory, named in his honor, orbits the earth. This observatory has lived up to its name, discovering new black holes, new supermassive black holes, and a new class of black hole. "Subrahmanyan Chandrasekhar." Famous Scientists. famousscientists.org. 2 Nov. 2014. Web.